Filtatron instantly looks like a Moog product. As you know, we usually like to round up the latest iOS apps on a weekly basis, but when a new one from Moog comes along - the Filtatron - we're happy to make an exception and tell you about it right away. As you can see, the interface has a very 'Moog' look about it, being clearly labelled and boasting large knobs. It's said that Filtatron can be used for processing live audio or files transferred from your computer, or even as a different type of field recorder. 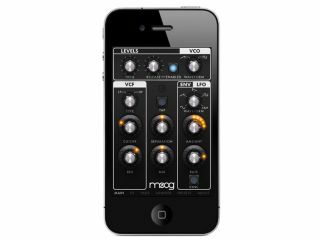 Of course, the release of this app may serve to infuriate the Moog traditionalists who'll consider it sacrilege to see this traditionally analogue company branching out into the digital world of iPhone apps, but we think it's an interesting and welcome move. Oh, and one more thing: if you're disappointed that this isn't an announcement about a new piece of Moog hardware, you may be interested in the rumour that the company is planning to launch the Slim Phatty - a rack-mountable version of the Little Phatty. Synthtopia reports that a blurry image of the synth has appeared in a catalogue, with the suggestion being that it's going to cost $799.